Online travel booking site Yatra.com witnessed over 3.1 million unique visitors in March, 2011. In comparison, rivals recorded lower number of unique visitors to their portals. 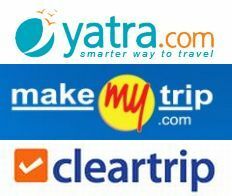 Makemytrip.com witnessed 2.97 million unique visitors while Cleartrip.com witnessed 2.13 million unique visitors in the same month. This data provided by digital marketing intelligence provider comScore shows an 84 per cent annual growth in number of unique visitors for Yatra.com. The Gurgaon-based Yatra Online Pvt Ltd is one of India's top three online travel agencies in competition with Cleartrip.com and NASDAQ-listed Makemytrip.com. In 2010, Makemytrip recorded a high of 3.5 million average unique visitors per month, according to a September 2010 investor presentation, but this appears to have fallen. Unique visitors is a statistic describing traffic to a website, counting each visitor only once in the time-frame of the report and is taken as a measure of a website's audience. In April, travel industry research agency PhoCusWright released the 'Indian Online Travel Traffic Report' in partnership with comScore, which noted that more than 40 per cent of Internet users visited the online travel category in 4Q 2010, representing a 45 per cent increase in unique visitors year over year. By comparison, the total Internet audience grew only 13 per cent over the same period. According to the report, Cleartrip attracted over three times as many monthly unique visitors as Travelocity India in the fourth quarter of 2010. Traffic to Expedia India also more than doubled in that quarter. Yatra.com currently records over six million page-views per month, spread across all its products from hotels, holidays and flights. Dhruv Shringi, Co-Founder and CEO of Yatra, said, "We have seen a surge in overall visitors over the past one year and we continue to outpace both the category and our competitors." Yatra.com raised Rs 200 crore in April from San Francisco-based Valiant Capital Management, Norwest Venture Partners and Intel Capital in order to expand inorganically in the domestic market. It also plans to go public in 2013.